Well, if you've been craving turkey (and we mean lots of it), you're in luck as the Santa Clara Valley Medical Center's Peer Support program and the Silicon Valley Independent Living Center will be serving their traditional Thanksgiving meals on Thurs., Nov. 16th. 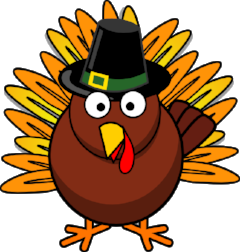 SVILC's annual People's Thanksgiving Luncheon will be served from 12-2 p.m. at the John Burns Gardens Community Room located at 820 Agnew Road, Santa Clara. It's free, fun and delicious! Enjoy a hot meal of turkey, mashed potatoes with gravy, veggies, rolls and pie. Consumers will also receive a $5 Safeway gift card from the Second Harvest Food Bank. But you must RSVP as space is limited. You may call (408) 894-9041 or send e-mail to info@svilc.org by Thurs., Nov. 9th.